Valentine's Day Contest Now Live You Can Win Free Everyday Valentine's Day Gift. This Contest Hosted By MaalFreeKaa And Sponsor's By Sanjali The Style Mantra Limited. 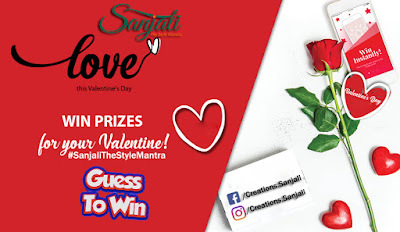 This Sanjali Sponsor This Contest You Can Win Every Day Free Valentine's Day Gifts. We are posted Every Day One Image Participants guess product name, price, discount and offer you post your answer as public view on Facebook Twitter And Instagram with using contest hashtag so track your answer or entry. Guess The Product Name and Win Valentine's Day Free Gift Everyday. 7. Like And Share All Post Duration contest period. 2. The Contest is open to all Indian citizens residing in India, of 18 years of age or above as on February, 2019. with a valid Facebook / Instagram/ Twitter account except the employees of Organizer and their family members, its advertising and promotional agencies and its auditors and their associate companies (‘Participant’). 3. The contest is being conducted from 9th February to 14th February 2019, 23:59 IST (‘Contest Period’). The Organizer may in its absolute discretion curtail or extend the Contest Period, as it deems necessary without any liability whatsoever; and no communication in this regard will be entertained. 5. Free to participate in the Contest no needed any fee. 7. Participants can submit any many answer for contest, however shall not use multiple Facebook / Twitter /Instagram account to participate. Only one entry will be eligible per participant. 9. The Valid Entries will not be judged depending on the all right answer. 10 The Winner(s) as selected by Sanjali will be announced on During Contest or before the March 2019. 1. RT/Share and Tag Friends to increase chance to win. 3. Winners announcement all our social page. Note : Correctly All Answer Eligible To Win Prizes.